Clarksville, TN – Sixty-five years ago, Henry Wyatt opened a small auto dealership in the heart of Clarksville built on the foundations of honesty and integrity. Henry’s son-in-law Sid Johnson spent the next fifty years at the helm, expanding on these core values and growing the family-owned dealership into the Clarksville institution it is now. 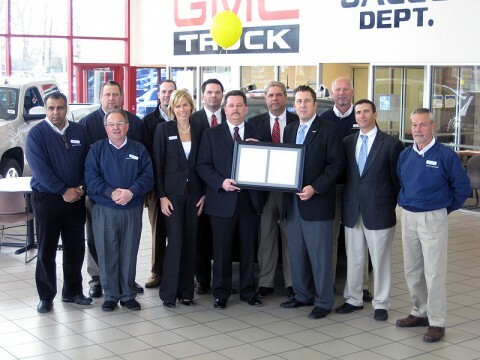 Honoring the legacies left by their founders, The Wyatt-Johnson Automotive Group has continued this tradition of excellence and was recently rewarded for their years of perseverance by being named the #1 Buick-GMC Dealership in Tennessee for the second year in a row. Sonja Rohra, Shannon Moats, Morris Lancer, Josh Meeker, Katherine Johnson Cannata -Dealer Principal, Curtis Nichols -Assistant Sales Manager, James Conley -Sales Manager, Sidney Johnson ­Dealer Principal, Scott Maletesta -GM Zone Manager, Mike Polston -General Sales Manager, Tim Farmer -GM District Manager, Doug Tallent (Those without titles are salespeople) The award is for being the largest volume Buick GMC dealer in thestate of Tennessee in 2010.